Everybody likes to talk about value, content and focusing on connections…very few people actually systematically apply it to their marketing. In today’s show, I introduce you to one of my favorite steps of The Hirsh Process, STEP TWO: Visibility. Learn how to go from thinking about doing Facebook lives to a fully integrated and implemented visibility strategy that skyrockets the results of your ad campaigns. 1:46	How much money should you really invest in visibility? 2:50	Why video equals more conversions and sales! 3:27	What is Marie Forleo doing that you should be doing? So today we’re going to talk about Step Two, which is Visibility and that means value, content and focusing on connection. And that’s one thing that in our agency and with our clients, we are huge on. Because we’re not just launching a marketing campaign, or putting content out there to get emails and sales. Of course we’re doing that, but we’re also building a brand. And we are building a brand and building a following is the long game. 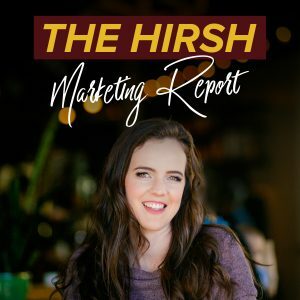 And that’s what The Hirsh Process really focuses on, because that’s the only people that we work with, is people who are building real businesses and are in it for the long haul, in it for the long game, and want to truly build a following, a loyal following, and obviously make sales, but this is the way to make sales. So, visibility means focusing on value, no-strings attached content. Now, the best way to do that, especially if you’re in the online space, because this means that people can only connect with you online, they’re not coming into a physical office or store, is through video, because they can see you and they can hear you and it is so, so powerful. So Facebook Lives, pre-recorded videos, but podcast, blogs, anything that is just putting out content to speak to your customer qualifies in this step. And it’s really the concept of posting things on social media, that’s why we have social media is to put social media content out there and to connect with people and to build the following. But here’s the kick and here’s what we do differently, is we actually put money behind this step. So I recommend five to 10 % of your marketing budget should go into this step consistently. And so that means, and here’s what it looks like for me and several of my clients, is they will do a Facebook Live maybe a couple times a month or some even a couple times a week, and then we’ll take that Facebook Live and we will promote it as an ad to cold traffic and people who don’t know them. And on Facebook especially, Instagram you can still get some organic reach, but Facebook especially, this is necessary for anyone to see your content, because nobody’s going to see it otherwise. And if you pay money to put it out there, you can target, obviously, the people who you exactly want to target, you exactly want them to see your content and you can put out those videos or blogs or whatever it is. Now I highly recommend that a big portion of this effort goes into video, in whatever format that is. I don’t care if it makes you nervous, it makes everyone uncomfortable to get on video, get used to it, especially if you’re trying to build an online brand. Some tough love there if you’re not doing video, literally you’re just leaving money and following and success on the table. This needs to be a consistent effort. And these things, and this content that you put out needs to be good. Not two minute Facebook Lives, not quick, no value, half of it pitch content. It needs to be good. Let’s take Marie Forleo as an example. She is an amazing client on our roster, and I want you guys to, if you haven’t had the chance to go and check her out, check her out definitely. She is amazing and a massive influencer and innovator in the online space with her B-School product. Every single week, she puts out a Marie TV episode. On top of that, they have consistent social media posting, but that Marie TV episode is very produced. It’s a lot of work, I’m sure it costs a lot of money and every week they put out a new one. I think actually more than once a week, and they now have it on Facebook Watch. And then they launch, one time a year, B-School. So all 53 of those other weeks that she isn’t launching, I mean she does put one out week of B-School, but it’s obviously promoting at that point, is value. Is building the audience, building the trust, building the following and here’s the thing. When you go and you listen to those episodes, or you have a conversation with their team, or you see what type of content that team puts out there, they truly, from the bottom of their hearts, care about their following. And about them getting results and about connecting with them. They obviously are here to grow a business and make money and they have been very successful at that, but they also really care about putting out quality, good, valuable content that serves their audience. And another client that we have on our list is Mel Robbins. She does an amazing, amazing job about this. And has insane success because of the amount and the emphasis that she puts in connecting with her audience. I guarantee you that any one successful out there today, especially in the online space, if you dig into their social media presence and their branding and their marketing, they are doing this. And a lot of times people come in and they see their successful webinar, or they hear about their successful webinar but they don’t look at this.This step is crucial. It’s crucial for the long game, it’s crucial for the success of the rest of your marketing, and it shouldn’t be glossed over. And what I’m trying to say here is not only should you do it, but don’t just do it to cross it off the list. Do it because you actually want to make a difference and because you actually want to connect with these people and do it from that intention and that place, because a lot of times, those things we have to say as business owners is why we started in the first place. And we forget about that, in the number of leads we get on our webinar and the number of sales. Don’t forget about that, because it will show. It will show in your marketing and it will affect your results, and this is such a crucial step. So think about and then this is a little bit going back to Step One, where you had to think about what problem are you solving and who are you targeting and make sure this content that you put out in Facebook Lives and videos and blogs and podcasts, is very intentional. Because here’s what you can do with Facebook and here’s what we do with The Hirsh Process, is we will take a couple of our clients top, amazing Facebook Lives, where they just crushed it and engagement was great and people were loving it and sharing the video, and really connecting with them, and we put ad spin behind that every single day, so new people continuously see it, and then we will take those viewers of that video and re-target them to the next step in the funnel, which I’ll talk about in the next episode, which is Step Three, lead generation. But the point is, a lot of people see a Facebook Live is like, man, I don’t have a huge following and if I go on Facebook Live, I have two people who come live, who cares about that? I want you guys to see the power of how long these social posts can live on to create value and a following and connection with people. Because at the end of the day, you will have nothing if you don’t have a connection and a following with your audience. And that’s where you will be able to build that. So if you haven’t done this before, I want you to make a list of a bunch of videos, 10 to 15 videos. Really make a list. 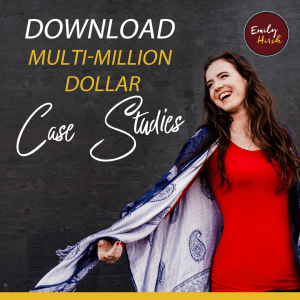 I have many of these lists, you know I do this, for myself, my clients do it, that really evokes emotion, and connects with your audience and gives them value and tips that they can go walk away with and things that they can do and implement. Make that list and then start putting out that content consistently. And it doesn’t have to be perfect. Do a Facebook Live from your car if you have to, just get out there and get on video. And then put ad spin behind it and go and reach new people with that content. Five to 10 percent of your marketing budget should go into this consistently. And I promise you the clients of mine that do this consistently and work with us in this way that they have valuable content they’re putting out there, and they put time and effort into this and really, look at myself. As a entrepreneur of a almost two million dollar business right now, I put a lot of my time into this, into marketing and being the brand for our agency. And if you are an entrepreneur, and you’re a CEO, your team should be supporting you in all other ways, besides they can’t show up on video for you, especially if you’re a personal brand. That’s your job. And if you’re not doing that, you’re making it so everything else in your marketing won’t have as much success. So make time for this, and put money behind this, to get amazing success, and again, can’t emphasize it enough, play the long game. Because I have people for both my clients and myself, who end up signing up as a client after one or two years of following me. The average customer length of one of our big clients is a year before they buy their product. That’s incredible. And way too often are people looking for that fast, and it doesn’t mean you can’t make money and you can’t convert] cold traffic. You absolutely can, and these strategies help you, but this is about big impact and visibility on growing your brand. So, Step Two of The Hirsh Process is Visibility. Everybody needs to be putting time and money, resources, into this for a successful marketing campaign, and big picture experience and brand awareness. And in the next episode we will talk about Step Three, which is lead generation. So make sure you stay tuned for that.